Marty McGuire by Kate Messner. Scholastic Press, 2011. Currently available. Face Value: At first glance, the illustrated cover of Marty McGuire blends in to the crowd of other Middle Grade chapter books. She’s a contemporary looking girl in a neutral, could-be-anywhere landscape. Not really attention-getting. In fact, if I had seen this book in a bookstore or on the library shelf without having heard about it ahead of time, I probably would have passed it by. Upon closer examination, however, Marty’s personality really shines in the cover illustration. She is perched precariously on a log and reaching for a (very distressed looking) frog. Her facial expression is hilarious – the tongue sticking out, the eyebrows shooting up toward the hairline. And the tiara. Oh, that tiara. It’s tumbling straight into the pond, and Marty doesn’t even care. Overall, I think that the cover fits the story very well and honestly broadcasts the nature of the main character, but it’s not going to be drawing much attention on its own. Does it break the slate? Folks, the slate is gone. Marty McGuire shattered it so hard that the only remaining evidence of the slate is dust. In Marty, we have a female character who is decidedly not pink and frilly yet still gets to play the role of the princess (literally). Marty doesn’t like the same stuff as the other girls in her class and is well aware of her difference from the female majority. What I love most about this book is that Messner doesn’t isolate Marty as a character. Marty knows that there are other girls in her class, like Rasheena, who are uninterested in princess play. And Marty also has friends who like both tramping in the mud and playing dress-up. There are no one-note characters to be found. Everyone, even the adults, is complex and believable. Who would we give it to? Every third grader everywhere, boy or girl. And their teachers and parents. Review: I have reservations about using the term tomboy, because it means different things to different people. By its nature, the term also relegates certain behaviors to the realm of “boy” and excludes them from the possible range of girl behaviors. Nevertheless, I think that’s the word that most readers would use to describe Marty. She’s dismayed when her best friend Annie, who used to love animals and playing outdoors, shows a newfound interest in princesses and girly things. So far, third grade is not going well for Marty McGuire. Mrs. Aloi shakes her maracas again. She says it’s to remind us to listen, but I think she just likes shaking them. When Marty gets cast in the class play The Frog Prince as the princess, it is a disaster. She is very grumpy about getting that role when almost every other girl in class would have been more suitable. Finally, she acquiesces, and the rehearsal process gets under way. “Let’s get one thing straight right now,” James says. He smiles a huge smile and rests his hand on the edge of the garbage can. “We’re going to make magic here. Theater is magic. So this can never be a garbage can again. It’s an enchanted wishing well.” He runs his hand over our painted-on cobblestones. “It’s made of cool, damp, mossy old stones, full of ancient magic. Anything can happen here.” When I look at his face, all serious and believing, I believe it, too. At this point in the book, I was pretty convinced that Kate Messner had written this book especially for me. I was a lot like Marty McGuire as a child, and now that I’m an adult I am a teaching artist who does what James Jackson does with Marty’s class. My very favorite part is in Chapter 8, when Marty describes in detail the improvisation exercise that James leads with her class. As I was reading, I was practically shouting, “I’ve taught that game! I know what that is! I do! I do!” This chapter was perhaps the best chapter I’ve read in any early chapter book, ever. Seriously. It was that well written. Minor chaos ensues as Marty makes a decision that alters the course of the school play. The frog that we see on the cover and meet in the beginning of the book comes back in a big way at the end, which I won’t spoil here. (But guess what – even the frog is an empowered female!) And although things work out fairly well for Marty in the end, her parents still take the time to lecture her about making responsible decisions. I appreciated that this moment was included in the story because in real life, no child would have gotten away with what Marty did without a serious talking-to. Marty realizes that her capriciousness could have a major impact on others. She learns the power of compromise and sees that it’s possible to like both Jane Goodall and princessy things – although pink and sparkly is still not her style. 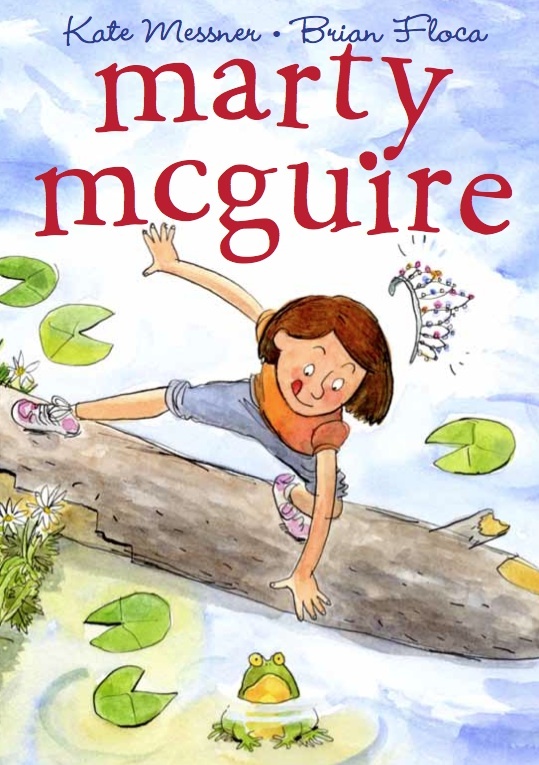 Marty McGuire is an amazing book for young readers because it includes so many positive character role models, both male and female. The adults in Marty’s life are all interesting, dynamic, and supportive people. Marty’s friends, both male and female, illustrate a range of childhood behavior and resist stereotypes – except for the ultra-feminine Veronica Grace. But I have a feeling that as the Marty McGuire series continues there will be more to Veronica Grace than what we see in this first book. Ultimately, no character is penalized for their likes and dislikes. Although Marty hates girly-girl stuff, she still has moments of success throughout the story. And the girls who love fancy clothes and dancing get to have moments of fulfillment too. The message is that we all have a choice, and we need to respect others’ choices, too. I think we here at Slatebreakers can definitely get behind that. This entry was posted in Middle Grade, Reviews and tagged Early Chapter Book, Jane Goodall, Kate Messner, Middle Grade, Reviews, The Frog Prince. Bookmark the permalink.